All residential general pest control contracts cover American Roaches, Oriental Roaches, Smokey Brown Roaches, German Roaches, mice, rats, silverfish, moths, non-poisonous spiders, ground beetles, centipedes, millipedes, earwigs, sow bugs, pill bugs, scorpions, crickets, and wasp nest up to 10 feet high. 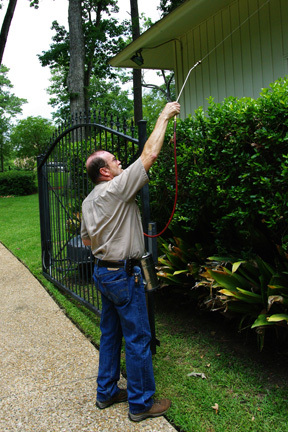 Your highly trained pest control professional will also sweep away the spider webs when we are performing your service. By treating your home from the exterior, you will have the convenience of not having to be at home. As a result, your exposure to pesticides is greatly reduced. In the event an inside treatment is needed due to an infestation, please give us a call and we’ll make an appointment that will accommodate your schedule. Permatox Pest Control guarantees these insects and will re-service your residence if there is an infestation between regular service dates at no extra charge. The Bi-Monthly "First Defense" contract has an initial charge of $80.00 followed by a $69.00 every other month charge. A one year contract is required to start service. Since 95% of pests come from the outdoors this bi-monthly service will include a regular perimeter treatment of 10 feet from the house and all entry points from the outside plus the control of ants (Pharaoh, Argentine, and Rover Ants) up to 50 feet around your home. We also use the highest quality products available to us in this industry. Our First Defense program is 100% guaranteed. If there is an infestation under this service in between service dates, inside or out, give us a call and we will send your highly trained pest professional to take care of it at no extra charge (in most cases, we'll be there the same day you call us) as long as your regular services have been completed. The Quarterly Pest Control service has an initial charge of $105.00 followed by a $95.00 every quarter charge. A one year contract is required to start services. We also provide separate services for Fleas, Ticks, Bed Bugs, Mosquitoes, Hornets, Yellow Jackets, Ant Yard Treatments (6 month guarantee), and Termites (Sentricon Termite Colony Elimination System). Call us at 318.686.3044 or 318.747.9395 to schedule your free inspection. "Let Our Family Take Care Of Your Family!"